When I posted the following comment on When Collapse Goes Kinetic in response to Kunstler, I should have expected the responses. "A freeze up of short-term lending would quickly lead to empty WalMart shelves" — Debt problems are already leading to thousands of stores closing including Toys R Us and Kmart. The latter was WalMart's chief competitor. Now, it and its sibling Sears are likely to finally go bankrupt in the next recession. Welcome to the Retail Apocalypse! FallenHero replied that "They closed because of amazon. When amazon starts closing maybe something will ‘happen’." I told him that I didn't think that was the entire picture. Amazon and the rise of online shopping are probably a necessary but not sufficient for the current travails of brick-and-mortor retail. The chains that are failing are also victims of poor management and predatory financing. FallenHero was not convinced. In addition, two other readers at Kunstler's blog mentioned Amazon with one calling it a predator and another comparing it to the Soviet department store GOOM. Oh, my, some people really don't like the tech retail giant. They're not alone in blaming Amazon for contributing to the demise of the victims of the Retail Apocalypse. I brought up Amazon in a reply to Kevin Robbins' comment Part 2 of Toys R Us in the Retail Apocalypse - Company Man in which he wrote "I suppose I can't blame Trump just because they ran the business like he would've." As for not blaming Trump, that's true, as much as we'd like to. On the other hand, we can blame two of his rivals, Jeff Bezos of Amazon and Mitt Romney of Bain Capital. Bain was one of the companies that bought Toys R Us in a leveraged buyout and left it saddled with debt. 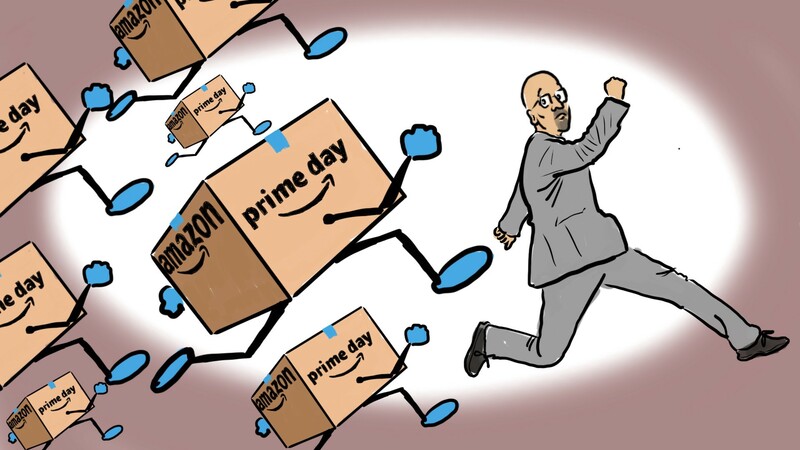 All of this makes for an elaborate lead-up to noting that Amazon Prime Day begins today. Company Man just happens to have the perfect video to answer the question How Did Amazon Get So Big? Amazon famously started in someone's garage, yet today they're massive. This video details the strategy they've been using to make it happen. Company Man mentions that Amazon has played a part in his videos about the decline of other retailers, including the one I embedded in Part 2 of Toys R Us in the Retail Apocalypse — Company Man, but otherwise doesn't allude to the disruption it has caused to brick-and-motor retailers or how it plans to take advantage of it. Even Retail Archeology explained how Amazon was planning on takig over vacant Toys R Us locations. I'm not done with the Retail Apocalypse. Stay tuned for the installment about Payless Shoes that I promised in Radio Shack, a tale of the retail apocalypse from Company Man and Retail Archeology after another late celebration of World Population Day. Flattery will get you nowhere. Deleted. Neither will repeating yourself. Deleted.